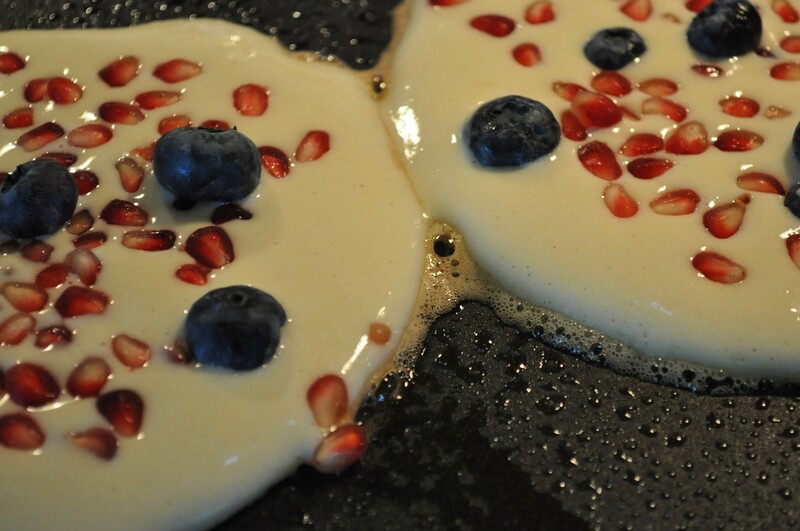 pomegranates | The Sassy Spoon: Fun Food! 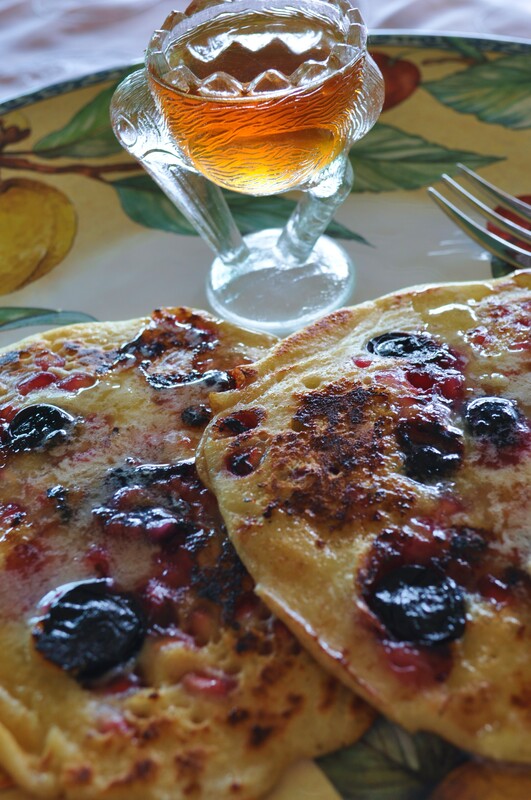 These are one of my favorite fall/winter breakfast dishes…. each bite bursts with flavor and they are full of antioxidants too. As soon as my pomegranates are ripe I start making things from them and this is just one of many things I like to do with them. I sometimes make them with sourdough starter, but you can also use buttermilk and flour as I give instructions for here. I use good Vermont Maple Syrup on the side. You can change out the fruit, but I really think this is an amazing combination. Bacon on the side is a perfect compliment. Bring on the Mimosas! Using a stand mixer blend together all but the fruit. You want a fairly thin consistency, but not as thin as crepe batter. Add more buttermilk or flour as needed. Make a plain test pancake first, it should be about 1/3 of an inch thick. Test heat by dropping a drop of water on it, it should immediately bounce. Pour two pancakes at a time unless you have a double size griddle. 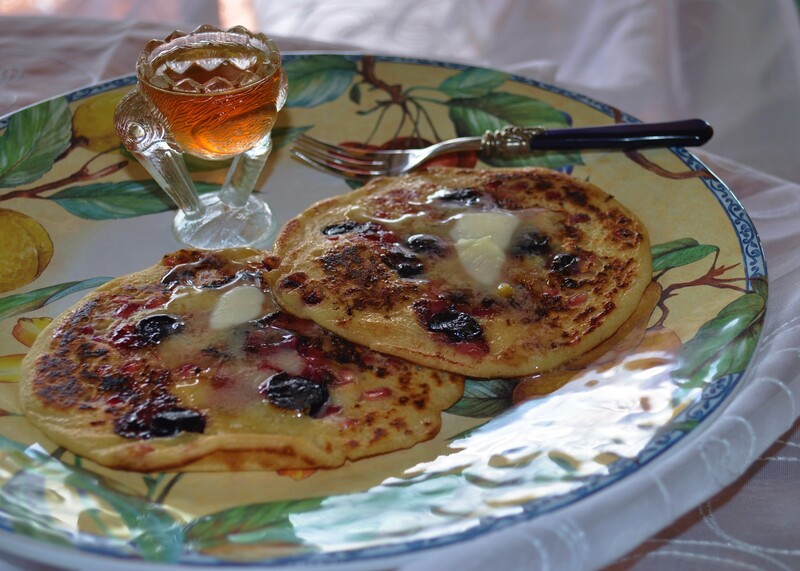 As soon as you have poured them on to the griddle, generously drop berries and pomegranate all over the top of the pancakes. When the pancakes start to have air bubbles, it is time to flip. Continue cooking till the bottom of the pancake is golden. You can lift the edge to check. This should take 1-2 minutes.